New recruits head for the departure lounge at Entebbe Airport, where they were flown to Abu Dhabi recently. Uganda earned $1.3b (about Shs5 trillion) in remittances from exportation of labour to the Middle East in 2017, a World Bank report shows. The report, which was released early this week, shows that this was an increase from $1.2b (about Shs4.4 trillion) which Uganda received in 2016. Ugandan workers in the Middle East stood at 65,000 in 2017, according to data from the Gender ministry. However, Uganda earned much less than Kenya, which recorded $1.970b (about Shs7.2 trillion) in 2017, up from Shs6.4 trillion in 2016. Tanzania earned $411m or Shs1.5 trillion in 2017. Rwanda got $181 m and Rwanda $34m. 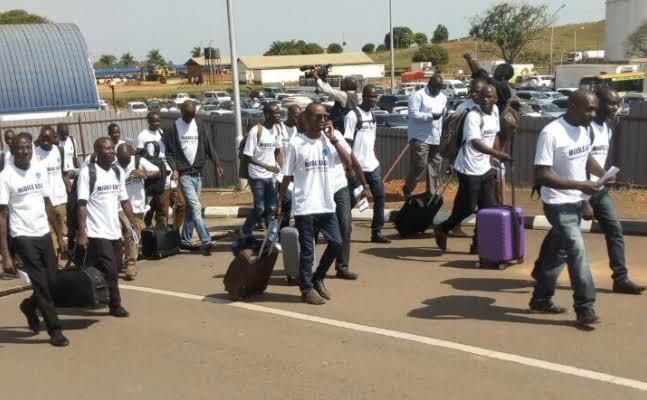 The number of Ugandans going to the Middle East countries has been increasing despite reports of mistreatment, especially of domestic workers. Government has since moved to sign labour export agreements with the recipient countries to ensure protection of Ugandan workers. Workers are now given work IDs when they arrive there and are asked to report to their embassies or high commissions in case of mistreatment.